On Saturday, December 12th of 2015, it was announced that Pittsburgh Penguins head coach Mike Johnston (and assistant coach Gary Agnew) had been relieved of their coaching duties. Wilkes-Barre/Scranton head coach Mike Sullivan was named Johnston's replacement (and Jacques Martin was named Gary Agnew's replacement). Mike Bales and Rick Tocchet retained their coaching duties. So, we all have a pretty good idea of who Jacques Martin is. 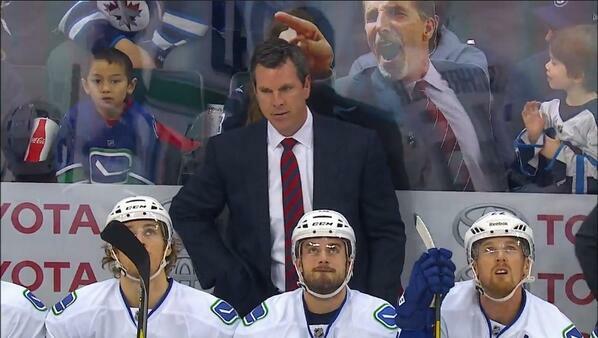 But what about Mike Sullivan? The guy was just handed a three year contract extension, so he must be pretty good, right? Well, let's go over his resume as a coach in the hockey world. Sullivan's coaching duties began one year after his 11-year NHL career. In 2002-2003, he assumed head coaching duties of the Providence Bruins, AHL minor affiliate of the Boston Bruins. It was quite the success, as they went 41-17-9-4 that year. In 2003, Sullivan was promoted to head coach of Boston by Mike O'Connell. His first year, similar to his AHL debut, was a success. He coached the Bruins to a 41-19-15-7 record, achieving first in the Northeastern division with 104 points. They exited the postseason in the first round, however, having been eliminated by the rival Montreal Canadiens. After the lockout, it was quite the opposite result as Sullivan's Bruins were last in the Northeastern division and missed the playoffs. Dave Lewis replaced him, as he was fired by the new general manager Peter Chiarelli. The next few years, Sullivan was the assistant coach to a number of John Tortorella-led teams, such as: Tampa Bay Lightning, starting in May of 2007; New York Rangers, starting in July of 2009; Vancouver Canucks, starting in July of 2013 (Sullivan was interim head coach while Torts served a 6-game suspension, and won the first game he coached as such). "He is very cerebral about the game. Really good [at] understanding the Xs and Os. Understanding the athletes. And I think he relates well to players too. He's the full package. Not because he worked with me but I think he is one of the most underrated coaches around. He should be back in this league sometime. He has strengths everywhere in coaching. The great thing about him is he's a better person. I think he is going to do wonders for that organization because of just how he handles peoples. He's very good with people also." Very good with people is probably a very accurate description of Sullivan. 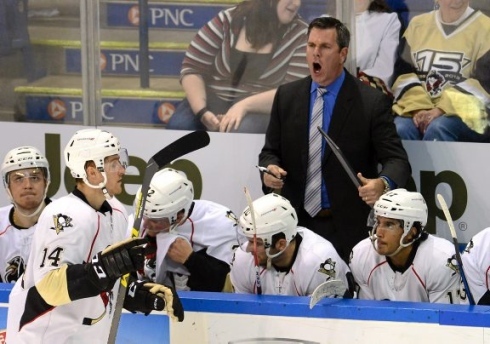 Before he was promoted, Sullivan lead a Wilkes-Barre/Scranton Penguins team to an 18-5-0-0 record. With limited offensive weapons, they were 2nd in the AHL in the standings as well as 2nd in the AHL in goal scoring. Three of the top 15 AHL scorers were WBS players (rookie Dominik Simon, Conor Sheary and Scott Wilson). Oleksy, who wore the A under Sullivan, called him the best coach he's had in hockey. Oleksy mentioned the HFD game as an example of Sullivan's strength as a coach. Oleksy "We were down 5-1 after 1P and in the room he didn't yell or scream but talked to us and challenged us. We responded." The Baby Pens ended up winning the game 7-6 in overtime. Oleksy: "he's done a great job bringing everyone tog here in a family like atmosphere in the locker room and that carries over on the ice"
Sheary on Sullivan "his time here has helped me trem. With the way we're playing its unfort for us but a great oppty in his coaching career"
Quite obviously, the players in that locker room admired and respected (more than for the most part) Mike Sullivan; not only as a coach, but as a leader. He inspired them to things the Pittsburgh Penguins probably wouldn't have been able to accomplish under Johnston and co. 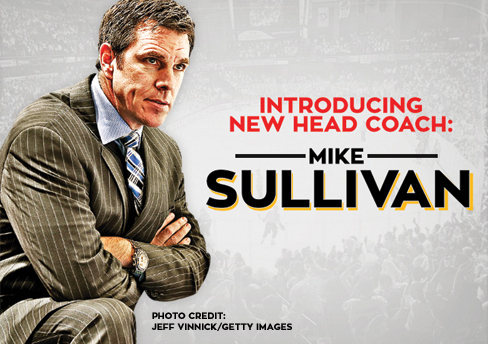 But now, Sullivan has another chance at the head coaching gig at this level of professional hockey. He has a chance to lead the Penguins to greater success, to inspire the Penguins produce offense at the level they were projected to prior to the season's beginning. Hopefully, for the Penguins' sake, he can do that. Mike Sullivan's first test comes tomorrow night (Monday) as the Penguins face Barry Trotz's Washington Capitals.